Shown here with one of her grandchildren, Sally Bagley is one of Virginia’s biggest cheerleaders. Born in St. Louis, Sally Bagley considers herself very much a Virginian. Like many of us, the Richmond City resident and grandmother of five has grown to cherish Virginia for its geography, among other things. Connected to that geographical diversity is a wide selection of products that originate here in Virginia. 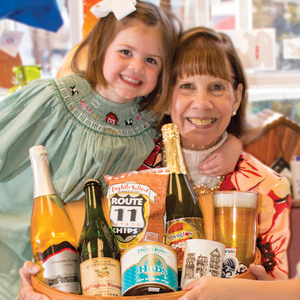 Bagley is forever dedicated to purchasing products made in Virginia for herself, her family, and her friends. With the holiday season upon us, she’s busy putting the finishing touches on her shopping list. 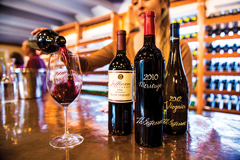 From premium country ham to the finest, award-winning wines, Virginia is home to a wide variety of products that are bound to satisfy even the most discerning tastes. Planning a holiday party? 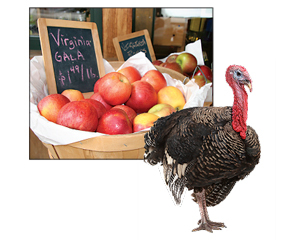 You can easily fill your table with foods from Virginia. There’s a lot more to Virginia cuisine than those peanuts in the crystal bowl you’ve positioned next to the mints, and your guests will no doubt be surprised to learn just how many delectable delights come from the Commonwealth. With its diverse geography stretching from the Chesapeake Bay to the Shenandoah Valley, Virginia is home to more than 47,000 farms. Not surprisingly, then, agriculture is the state’s largest industry. But Virginia touts so much more. Let’s take a look at some of Virginia’s finest products by region. Although many associate the blue crab with Maryland, Virginia is the nation’s third largest seafood producer. Tangier Island on the Eastern Shore of Virginia, is often referred to as the “soft shell crab capital of the world.” And while it may surprise many to think of Virginia as a top oyster producer, it shouldn’t. The state recently marked its largest oyster harvest in more than twenty-five years. 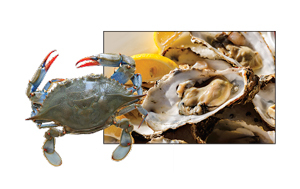 The diverse flavor of Virginia oysters – from the saltiest on the Eastern Shore to the sweeter taste of Rappahannock River oysters – gives residents and visitors alike a lot to love about this tasty treat. Croxton’s great grandfather started Rappahannock Oyster, located in Topping, in 1899. Ryan plans to continue family tradition for years to come. “It’s a part of Virginia history, part of our heritage, and I’m proud to carry that on,” he said. 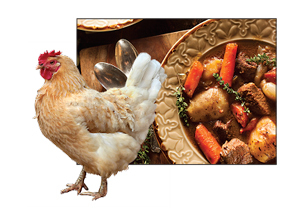 When you think comfort food, do you think stew? Look no further than Brunswick County for some of the most hearty and satisfying. Brunswick stew is a staple in many pantries across the state and is served at most cool-weather festivals in the region, like the one this month at the 17th Street Farmer’s Market. This region is also known for quality seafood, but its ham and peanuts really put it on the map. Most famous are the Smithfield hams, which, by law, must be cured within Smithfield’s town limits to earn the right to display that label. The early settlers learned from the Indians how to smoke meats, and since that time Virginia’s reputation for producing the best hams has exploded. Walk into any Virginia gift shop, and you are bound to find a ham or two for sale. More often than not, Flick said, peanuts are included in the gift assortment. Who, after all, hasn’t heard about the Virginia peanut? Virginia peanuts are the largest of the four peanut types grown in the United States. High in protein, despite the allergy issues many families struggle with, peanuts are still a healthy snack for the majority of us. One of Flick’s customers stops by regularly to stock up on peanut packs for her children. Peanuts have been around for about 3,500 years and are thought to have originated on the slopes of the Andes in Brazil and in Peru. Portuguese traders, explorers and missionaries transported peanuts to Africa and Spain. From there, they traveled by ship to The New World and were planted throughout the South. Peanuts were an excellent food source aboard ships because they were inexpensive and nutritious. Virginia’s first commercial crop was grown in Sussex County in the 1840s. Today, peanuts are sold roasted in the shell, salted, unsalted, and seasoned with Old Bay, smoked Cajun, chili lime, mesquite barbecue, and more. The fertile valley makes this area perfect for apples and peaches. Poultry is also raised in abundance here, with broiler chickens being the second largest agricultural product for the state. During the cool, crisp days of autumn, visitors swarm to pick-your-own orchards for apples. When warmer weather arrives, they return for sweet peaches, nectarines, and other crops. Virginia merchants could not agree more. Bill Bien has always been one to enjoy a nice cold beer on a hot summer day. You know, the kind Virginia is famous for? But it wasn’t until craft beer hit the Richmond scene that he really began to savor the taste. Legend Brewery Company in downtown Richmond is Virginia’s oldest microbrewery. Since it opened in 1994, though, the state’s craft beer industry has exploded. 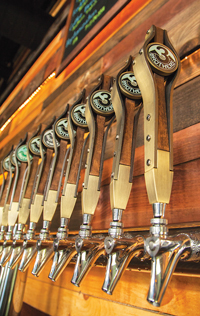 Today, Virginia is home to more than eighty breweries, with more opening every year. Richmond is home to about a dozen. People are taking notice. To celebrate the growing industry, August was designated Virginia Craft Beer Month in Virginia by the Virginia Tourism Corporation. And the Travel Channel recently named Virginia as one of the nation’s top seven beer destinations. You can find Virginia’s craft breweries in the relaxing countryside of Lexington as well as faster-paced Alexandria. Rural Goochland County got in on the action last year when Sean Pumphrey opened Lickinghole Creek Craft Brewery with his wife, Lisa, and friend, Farris Loutfi. The 220-acre farm grows hops, barley, herbs, and spices for use in the brewery’s Estate Series of beers. Thanks to the passage of Senate Bill 604 in 2012, breweries licensed in the state can now sell their beer for on-premises consumption. That has translated into big business in Virginia, with craft beer making an estimated economic impact of more than $622 million. A study by the Brewers Association found that the craft beer industry employs more than 8,000 people, with an average wage of $33,541 and total labor income of more than $273 million. Since Hunter founded the group in March 2013, membership has tripled and now stands at about four thousand strong. Many members, including Hunter, enjoy giving unique brews as Christmas gifts. Gingerbread Stout, for example, is a big seller for Hardywood Park Craft Brewery in Richmond. Yes, craft beer is all the rage, but first came wine, and Virginia is home to more than two hundred wineries, with locations in nearly every region of the state. Pretty impressive numbers, when you consider the Commonwealth had just six wineries in 1980. 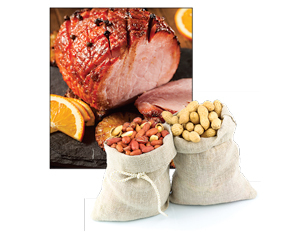 Embrey typically purchases hams, peanuts, and other Virginia products to send in gift baskets to relatives and friends in Nebraska, Colorado, and Richmond. And while hams and peanuts may be the most popular Virginia items to give as gifts, Virginia wines are gaining ground as the state’s wine industry continues to grow in both the number of wineries and in prestige. Virginians have made wine for more than four centuries, but admittedly, weren’t very good at it. Even Thomas Jefferson tried his hand at it, but was a failure. But spurred by his love of fine wine and his cultivation at Monticello of classic vinifera varieties, a small wine industry arose in the state in the early nineteenth century. It suffered setbacks during the Civil War and Prohibition. Wine production resumed in the mid-1970s and has soared since as winemakers continue to refine production techniques. Jefferson would be thrilled to know Virginia wines now regularly win awards at national and international wine competitions. That recognition is paying off big time. According to a recent economic impact study, the Virginia wine industry employs 4,700 people and contributes almost $750 million to the Virginia economy each year. Previous articleThank you for picking up this issue of RFM! Janet Showalter is a freelance writer who lives in King George with her husband.